Blarney Castle was originally a timber hunting lodge built in the 10th century, which was replaced by a stone castle in 1210. It is an Irish landmark that is a favorite attraction of tourists going to Ireland. The castle lies about four miles to the northeast of Cork City and is one of the most famous buildings in Ireland. 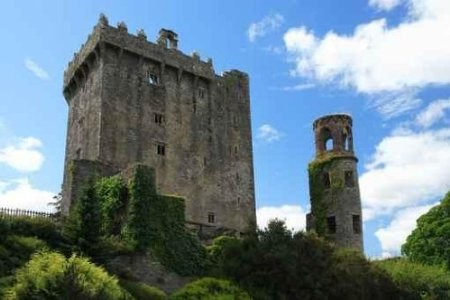 Blarney Castle, famous for the Blarney Stone, is said to give the gift of gab or talk ('blarney') to those who kiss it. The stone itself is set in the wall below the battlements and, to kiss it, you must bend over backward and lower yourself down about two feet at the top of the castle while holding onto a metal railing. 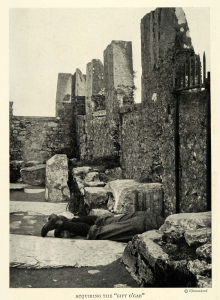 There are a few different versions of how the stone came to be placed in the battlements of Blarney Castle. In fact, it is half of the Stone of Scone, where Scottish Kings were crowned, which now resides in Westminister Abbey in England. 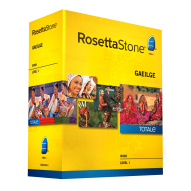 It is said to have been given as a gift of appreciation to the King of Munster, Cormac McCarthy, by Robert the Bruce. The King had sent troops to assist him in the Battle of Bannockburn in 1314. Some time later the stone was then set into the battlements of the present castle. The legend that one could get the 'gift of gab' by kissing the stone may have grown from the antics of Cormac Tiege McCarthy, the Chief of Muskerry, or Lord Blarney, as he was known in the time of Queen Elizabeth I. It is told that the Queen came up with the phrase 'talking a load of blarney'. This was due to her frustration with Lord Blarney's ability to talk endlessly for hours without ever actually saying much of anything. He had answers for everything without ever actually making sense. Because of this annoying habit, the Queen would rant at him that his talk was 'all blarney'. She must have been somewhat amused by him as she tolerated him for quite a long time. The building of the present castle is attributed to Dermot McCarthy, King of Munster, in 1446. It is set just south of where the River Martin joins the Blarney River and the view from the top of the castle is breathtaking. The view alone is worth the climb, even if you do not have the courage to kiss the stone. The narrow windows, or arrow slits, are typical of castles of the time. The defenders of the castle could shoot arrows at the enemy below, while it would have been extremely hard for an enemy soldier to shoot an arrow through these windows from below. The castle walls are over 18 feet thick in places and it was also built at the top of a small cliff face making it even more difficult for invaders. The grounds around Blarney Castle are well kept and very beautiful and many Irish couples, after getting married, go to Blarney Castle to take their wedding photographs. On the grounds you will find a Druidic circle made of stones, which is said to be a Druid garden and a place where they worshipped. The village of Blarney is charming and is one of the last remaining intact estate villages in Ireland. It has it's own town square which is literally an extension of the castle from the old days. 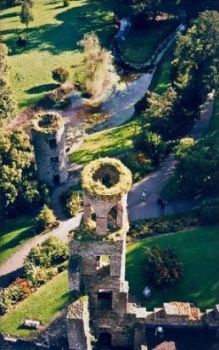 Click here for more information on Blarney Castle.